Polyommatus hispana, the Provence chalk-hill blue, is a butterfly of the family Lycaenidae. It is found in Spain, southern France and northern Italy. The wingspan is 16–18 mm. The butterfly is on wing from April to September. The larvae feed on horseshoe vetch. 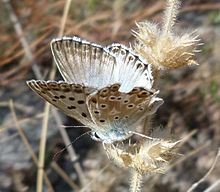 Wikimedia Commons has media related to Polyommatus hispana. This page was last edited on 2 May 2018, at 15:42 (UTC).